Injen now offers air filters made in conjunction with AMSOIL designed to replace or upgrade the filter that came with your Injen Air Intake. 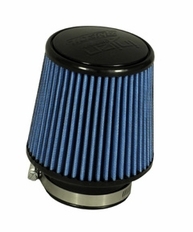 AMSOIL Ea Air Induction Filters offer better efficiency, excellent airflow and are cleanable. Best of all, the Injen/AMSOIL Filter is DRY, meaning NO MORE OILING! The Injen/AMSOIL Replacement filter filters over 99% of all dirt/dust particles (a standard oiled filter is about 98% efficient). You can also clean the Injen/AMSOIL air filter with a shop vac, meaning you won't be spending your hard earned money on oil and cleaning kits any more! The Injen/AMSOIL air intake filters can also be used with any other brand of intake that you want to bring our quality filtration to. The part number for this Injen Dry Replacement Filter is X-1020-BB.